The 9 Box is a simple and helpful tool that can be used to support all aspects of the Succession Planning Process – from assessment and talent review through development and talent planning. Provides a sample set of behavioral definitions to help you define low, moderate and high performance. Includes descriptions of leadership potential factors created by Industrial Organizational psychologists from which you can choose and customize. Contains an easy to use template to create your 9 Box category definitions. 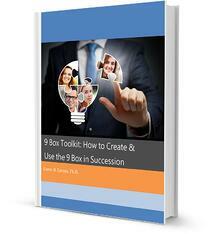 Offers tips and suggestions for using the 9 box in all four phases of Succession Planning: Talent Assessment, Talent Review, Talent Planning and Talent Development. Transform Succession Planning Your Way!